Dieses große, 1600 Quadratfuß Condo hat einen offenen Grundriss. Es ist ein sonniger und frisch, vier Schlafzimmer, zwei Badezimmer Eigentumswohnung Einheit auf der zweiten Etage mit einem tollen Blick von der Terrasse in den Morgen Besuche die Brandung. Das Feuerwerk jeden Freitag Abend von unserem gesamten zweiten Stock Deck. Es ist nur sieben Häuser von Strand und der Uferpromenade im Zentrum von 3 großen Wasser- und Freizeitparks. Ein kurzer Spaziergang zu Restaurants und Einkaufsmöglichkeiten. lmkuep bei verizon net für die Verfügbarkeit und Preise. Sie müssen Blätter und Handtücher mitbringen. NICHTRAUCHER & KEINE HAUSTIERE ERLAUBT. Neue Fliesenböden im gesamten Wohnbereich für eine einfache Reinigung und Teppichboden in den Schlafzimmern. Eine voll ausgestattete große Küche, alle neuen Edelstahlgeräte, Granit und Schränke. , Dining (Feeds 12) und Wohnbereich mit hohen Domdecken. Genießen Sie einen 55-Zoll-Fernseher im Wohnzimmer und einen 37-Zoll-Fernseher im Hauptschlafzimmer. Schön eingerichtet und benutzerdefinierte dekoriert. Eine sehr komfortable und entspannte Rückzugsort am Meer. Sie werden nichts dagegen, zu bleiben, wenn es regnet. Stichwort: Ozean / Boardwalk View, 2 Familienhaus - 2. Stock 4 BR, 2 Badezimmer, privater Außendusche, Alle wichtigen Sehenswürdigkeiten sind zu Fuß erreichbar, finden Sie unser Gast Kommentare !! We’ve been vacationing in Wildwood for many years. This by far was the most clean and spacious stay! My family and I were very impressed with just how spacious and clean this property was. Not to mention the beautiful view and accommodating ammentities. My friends and family enjoyed our stay at this condo in August. Location is great, close to beach and all activities on boards. The first half of week was spent with my friends (3 adult women), and we were very comfortable, enjoying morning coffee and evening cocktails on the deck! The second half of the week was spent with my family (husband, 3 grown children, spouses and grandchildren). It was a little tight for all of us but we knew it would be, and made it work with air mattresses. This unit is well stocked with everything you need, and Linda (the owner) is easy to deal with. Although I don't think we will be back, as our family continues to grow, it was a great stay! The only note I will make, is you are on the 3rd floor - which makes for great views, but keep in mind you have 3 flights of steps to carry up luggage and groceries! A dumbwaiter would make a nice addition! We had a great time and were very comfortable. The condo is quite spacious, with enough room for everyone to have their own area. We cooked at home a number of times and had every kitchen utensil needed. Though only a minute or two to the boardwalk and beach access, the house is centrally located allowing for short walks to barber shops, nightlife, and restaurants as well. Finally, the condo was baby friendly, no sharp corners and plenty of room to crawl. We would rent this condo again, it felt like home. My family (2 adults, 2 young children) and my brother's family (also 2 adults and 2 young children) stayed here for a week in August. I second that the pictures do not do this place justice. It is spotless, spacious, and bright. The deck is perfect to have an outdoor meal or watch the fireworks. It is close to the beach, right in between two main piers, yet you do not hear any unwanted noise from inside. The owner was very kind and helpful. I would definitely recommend this condo for your Wildwood vacation! If we return to Wildwood (which we may!) we would definitely book this place again! 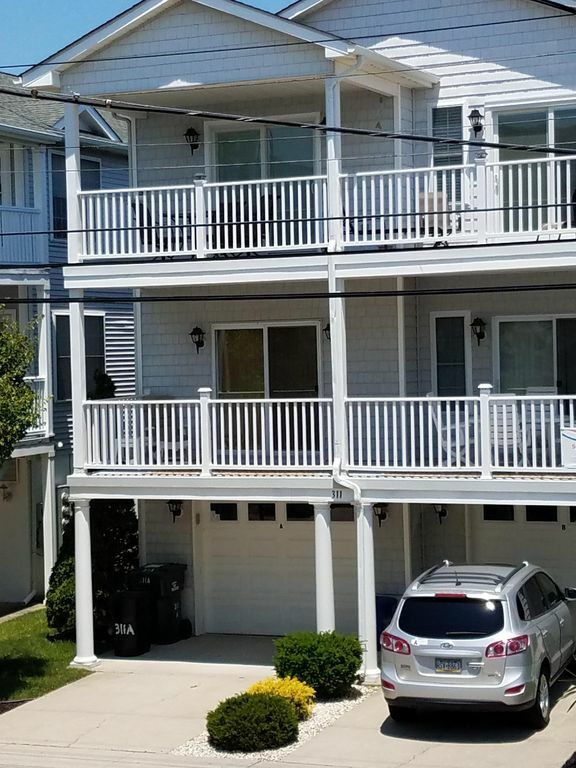 Perfect condo for wildwood beach and boardwalk! We just got back from staying here and it was Perfect to have walking access to the boardwalk and beach. Our daughter loved the amusement piers that were so close in each direction when you get to the boardwalk. We never used our car once throughout the week. Thanks Linda for your help and assistance. She is great to deal with! Would definitely use again! Pictures of the condo do not do it justice.It was so much nicer and roomier than we anticipated. We only moved our car to go to Cape May everything else is at your fingertips. The kitchen had everything we needed and more. We also loved the BBQ out on the deck. The condo was great all up to date appliances loved having a washer and dryer. Linda was fantastic she always got right back to me to answer any questions we had. The condo is very clean so close to all the action we would definitely stay there again! Thanks again friends from N.Y.